The tales of the Hindu dharma have been about sundry characters, many are enigmatic to their core and will leave you bewildered. But what also brings about irrevocable fascination to the generations to come by is the deeply woven emotions and conflicts underlining it between each character. Of many, one such character is Subhadra, younger sister to Krishna and Balarama and who was also the wife of Pandava prince Arjuna. Thus, the love story of Subhadra and Arjuna has been the epitome of sacrificial love in the entire epic of Mahabharata. As it happened, after being exiled for 12 long years, the Pandava Prince Arjuna spent much of his time traveling to holy shrines, and austerities, thereby relishing most of his time in spiritual journeys. On one of many such travels, he reached Prabhasa, a historical town on the west coast of the Bharat Brasa, the terminology being referred at that time to most of the present day Indian sub-continent. It was near Prabhasa, Lord Krishna had built the magnificent city of Dwarka and it is in this place the epic tale of romance was recorded. Arjuna had fancied much about the princess who was said to be of incomparable beauty and endowed with every womanly quality. 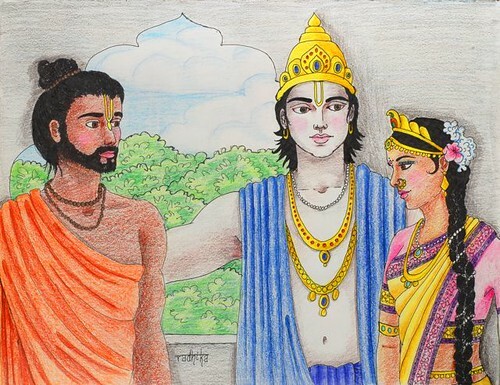 But much to his disappointment, Krishna revealed to him of preparations being made to wed off the princess to Duryodhan. It was Balarama, Lord Krishna’s elder brother, who intended on marrying Subhadra to Duryodhan. It was according to Lord Krishna’s plan with a concealed identity and in the disguise of a renunciant, or Vaishnava sanyasi he entered the city. As anticipated, Balaram who was fond of ascetics and sages did invite the Vaishnava Sanyasi and offered his service to the renunciant. Little did he know the renunciant was Pandava prince Arjuna. Arjuna was captivated by her radiance, he had little choice but to madly fall for her. Fortunately, things did work wonder for him, Subhadra on careful inspection noticed the sage to rather have the qualities of a prince, the young sage seemed a better prospect to her than the conceited Kuru prince Duryodhan. Over the course of many weeks, their fondness for each other only grew. On one occasion, in confidence, Krishna spoke with his sister and she did have admiration and feelings for the strange sanyasi. It was then Krishna revealed the sage as being the Pandava prince Arjuna. She could not believe all of what had happened. She too was deeply and madly in love with the Pandava prince. Finally, the rains did stop pouring and at the end of Monsoon, it was time for Arjun to leave Dwaraka. He was in turmoil, for he was to leave his lover behind. But again Krishna came to his rescue and informed him of the festival to be held at Raivataka hill, which all the Yadus would attend. It might be his chance, added Lord Krishna. But he did add, the only way for the lovers to unite would be kidnapping the princess in the midst of her friends and relatives. On the day of the festival, all the great personalities of Dwaraka were present including King Ugrasena, such magnificent was the sight, it resembled the assembly of the Gods. And as the Yadus sported and enjoyed themselves in the fragrant woodlands on the Raivataka, Arjuna, now in his usual attire, mounted his chariot. 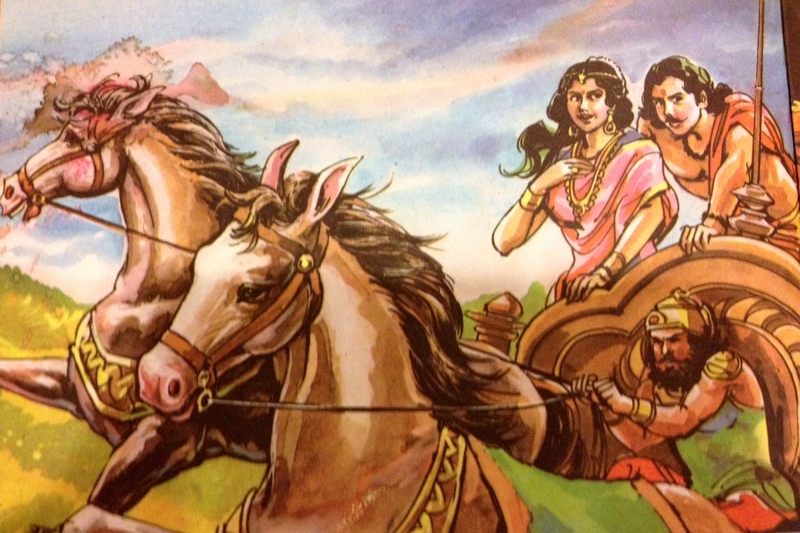 When he spotted Subhadra surrounded by her friends and maidservants standing near a temple of Vishnu without any delay Arjun spurred the horses and rushed toward the princess. In no time, he had taken hold of her hand and pulled her onto the chariot. Before anyone could react he raced away to the north, back to Indraprastha. As they Yadus realized the abduction of their princess, they became incensed. Who could have been so bold that he dared to kidnap their princess before their eyes? It was a call to arms. A council of war was hastily assembled in the Yadu court. Balaram glared around the assembly, the fierceness in him poured down from his eyes blazing like fire. A war with Pandavas seemed relentless. Lord Krishna proposed an alliance with the Pandavas, and especially with Arjun, as proper. Arjun had been born in the noble Bharata race. He was the son of the illustrious Kunti, from their own house. No man on earth was capable of vanquishing Arjun in battle. He was now proceeding on Krishna’s own chariot and would be difficult to check. And most of all, Subhadra and Arjun were a good match. Better that they send swift messengers to bring him back in peace and arrange for a proper wedding. That would avoid the disgrace of being defeated by Arjun and would enhance the alliance forged by the marriage. The city was decked out in flags and festoons and a great ceremony did take place. Arjun accepted Subhadra’s hand before the sacred fire with the blessings of the Rishis.